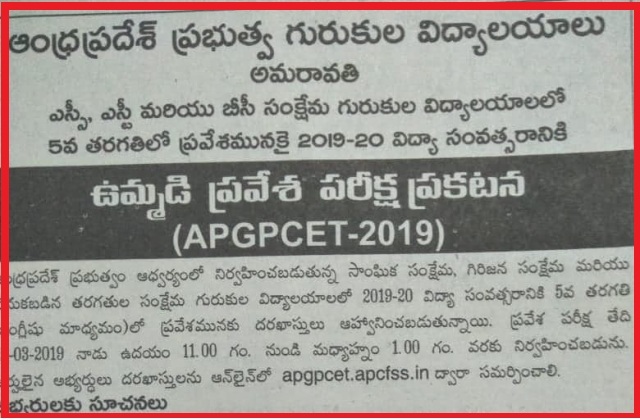 Andhra Pradesh Residential Educational Institutions Socities of SC Welfare Tribal welfare BC Welfare and other institutions are inviting Applications to get admission into 5th class in above mentioned residential schools of Andhra Pradesh. SC / ST students should have born between 01.09.2006 to 31.08.2010. OC / BC / SC-Converted Christians (BC-C) should have born between 01.09.2008 to 31.08.2010. The students are eligible to apply for admission in their native district only. The Native District of the candidate means the place where the student studied for a period of two years in Class 3rd & 4th i.e. during 2017-18 & 2018-19 in schools recognized by Govt .of A.P. or native place as certified by the competent authority. The candidates are responsible for any wrong entries made during the submission of applications through online. No corrections will be entertained/taken into consideration once Hall Tickets are generated and at the time of admission. The candidates may apply another application with correct information for generating Hall tickets.